Phoenix College, the flagship institution of the Maricopa County Community College District, has recently adopted a video solution provided by NanoLumens. With the help of NanoLumens, Phoenix College has been integrating 21st century technology into a 20th century architectural masterpiece. 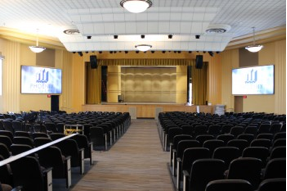 The renovation involved the installation of new electric rigging and drapes, LED lighting, mechanical systems, structural enhancements and cosmetic renovations. Great care was taken in the selection of the finishes, windows, lighting devices and colors to enhance and capitalize on the original design of the building. Even the original outside lighting fixtures were refurbished and reused. These fixtures are now re-installed with LED lamps. Each need examined in the planning and completion of this project was reviewed for relevance from a functional and historic standpoint.